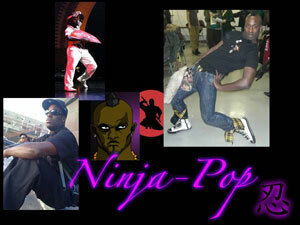 Barcelona Dance - Waacking & Voguing - Interview with Aus Ninja N.Y.
AUS: 'I was born in Texas and raised in Kentucky. I started dancing when I was 6 years old doing Traditional Dances I am from Lipan Apache and Choctaw American Indian tribe from the Southern part of the United States. I moved to Kentuky when I was 6 continuing doing tribal dance, then my next style of dance was break dancing hip hop poppin when I was 13. I went to high school to study musical Theatre as tap, ballet, lyrical, jazz and then I went to a Performing Art College and got a 'BFA' in Musical Theatre. Then I moved to New York. I toured in a couple of musicals for about 2 years then I switched my focus after meeting Brian Green as my first teacher who started telling me about 'Waacking' and 'Vogue'. Brian Brian informed me about different clubs to go to in New York, there was one called 'The Club House'. This was in 2004, so I went there and that was the first time that I saw the Vogue Scene in New York. In 2001 I went to some clubs where I actually saw some people dancing this style but I didn't know this style was called 'Vogue'. 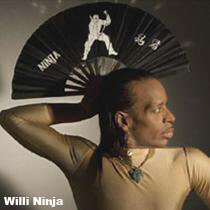 From there I started to go deep inside of the culture and I ended up eventually joining up the 'House of Ninja' at the end of 2005 while Willi Ninja was still alive. AUS:'Mohammed Omni is my actual teacher. He is a Vogue Legend he is in the documentary called 'How do I look'. He has information about all kind of different people and I am lucky enough that he taught me to hand down a lot of information too because he hasn't done it for many people. He's been involved into the Vogue scene for about 20 years and I kind of help him bringing him back. AUS:	'It would be someone from the ballroom scene who starts to get famous walking (competing) categories and then would end up creating his own 'house'. When the 'House' concept came up, it actually started with 2 groups, you had a Spanish group and then you had a black group gathering African Americans, Indians and also people from Caribbean. They would go to the clubs as 2 separate groups battling each other. AUS:'I met Willi through a man called 'Shack-A-Lock' who also introduced me to Tyrone. Shack-A-Lock is an old school dancer from New York, he's a Locker who knows all the Original Lockers such as Don Campbell.